Another incredible issue from the new creative team! This can be considered the “Empire Strikes Back” of this premiere 3-part arc that Adam Beechen and Tim Seeley have constructed. Things do not bode well for our heroes. They just witnessed The Red Blade forces defeat an entire fleet and now they’re returning to finish off our heroes! I think this is the strongest issue of The Authority: The Lost Year yet. Last issue was more of a bridge between this arc and the previous. It gave closure to the first arc but set up how The Authority got to where they are now. For a first-time reader, there isn’t much missing info, so I think a person picking up this issue wouldn’t be lost. During the past month, the Wildstorm Universe has been thrown into chaos throughout all the World’s End titles. And it has been a great read! 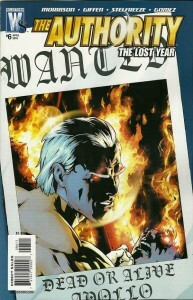 The Authority #18 set up the dilemma: The Carrier is leaving Earth. Which heroes are going and which are staying? 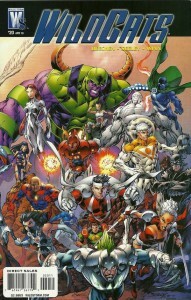 Wildcats #19 showed the war being waged by the heroes who stayed on Earth against the lost Kheran force known as The Red Blade. 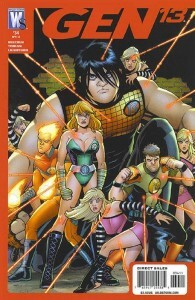 This issue acts as an addendum to Wildcats #19 as we see the same battle but from the perspective of Runt from Gen 14. Marc Bernardin & Adam Freeman continue the adrenaline rush from last issue as this one opens up. But they soon slow things down enough to give the reader (and the characters) a chance to catch their breath. 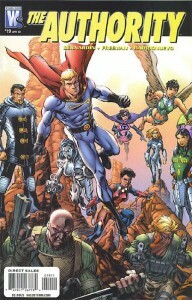 For now, The Authority consists of a smaller cast of characters than what we saw in the latest issue of Wildcats (#19). This allows for some really good characters moments in this issue. But fear not, because we do still get some action here.